The Peugeot Prologue previews the 3008. The Prologue debuted at October's Paris auto show. ROUEN, France -- PSA/Peugeot-Citroen could delay the introduction of plug-in diesel-electric hybrid cars as it seeks to cut costs during the economic downturn. Ladimir Prince, manager of PSA's hybrid innovations unit, said the carmaker's plug-in hybrid project "could be delayed by a year or two." But Prince said the economic crisis will not slow PSA's plans to launch diesel-electric hybrid cars. 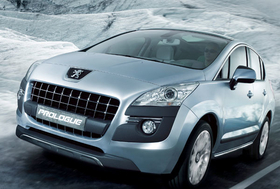 Prince said PSA is still working toward launching a diesel-hybrid powertrain in 2011 in the Peugeot 3008 crossover. He said PSA estimates potential sales of diesel hybrid cars in the tens of thousands, not millions. PSA presented its diesel hybrid technology in Citroen and Peugeot concept cars at the Paris auto show in October. Prince gave an overview of the carmaker's hybrid vehicle plans in Rouen in northern France during a trade show, which was sponsored by the Mov'eo automotive and transport r&d cluster. He said PSA is moving forward with research on plug-in electric hybrids, but does not have a date for series production. "A lot of our future decisions will depend on battery costs," Prince said. More government support for alternative propulsion vehicles could also speed development, he said.